Competition for single, pair and Group Poomsae. Special category for parent(s)/child(ren). Traditional forms, Creative Forms and Music Forms. Power- and Technical Breaking: Knife Hand, Fist, Side- and Backkick Breaking, High Jump and Long Jump Breaking, Serial Breaking. During the competition: Serial Breaking and Team-Demo. At the Opening Ceremony: Martial Arts demonstrations and Show acts. Safe board breaking for Kids using electronic striking devices. Electronic kicking contest on a computerized sandbag. The past Vienna Taekwondo Festivals have been highlights of our series of events since 2014. In 2019 we will organize this event for the sixth time. 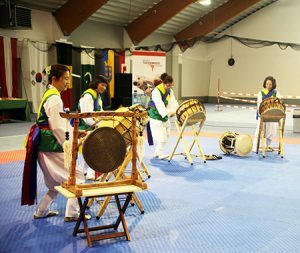 As always the Vienna Taekwondo Festival will feature the full program of the Hanmadang-Festival in Korea. But we want to specially address those people who normally do not participate at Taekwondo tournaments. For those we offer special categories for beginners and newbies. 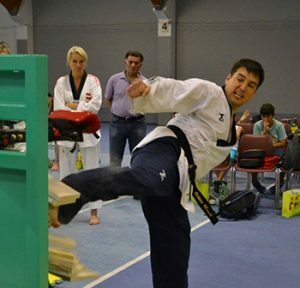 The Vienna Taekwondo Festival bridges the gap between sports and Korean culture. 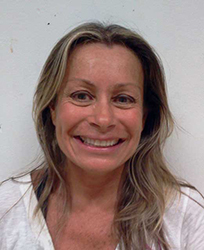 At the same time the joy and fun when practicing Taekwondo with like-minded people is our main goal. Like in 2018, the Vienna Taekwondo Festival will be held parallel and together with the Vienna Taekwondo Championships. This combination has proved successful for both events. With its additional competition categories the Vienna Taekwondo Festival is an enrichment for the participants of the Vienna Taekwondo Championships. At the same time participants of the Taekwondo Festival have the opportunity to take part at the competitions of the Vienna Taekwondo Championships. In addition to the usual Hanmadang categories there will be again a parent(s)/child(ren) Poomsae category, the kick competition for children on electronic sandbags and the breaking event for children on electronic soft-targets, that have been introduced in the last years..
As in the years before, the competitions will be divided into various age categories and skill levels. This will make it easier for beginners and at the same time boost up the competitions for more experienced participants. Another highlight will be again our opening ceremony, where you can see martial arts demonstrations as well as performances of various Korean artists. Starting from September 2019, you can download the outline and the rules of competition from this page and you can forward your application online as well. You also will find more infos on facebook at: https://www.facebook.com/ViennaTaekwondoFestival. The Embassy of the Republic of Korea in Austria has taken over the patronage of this event and we are supported by various business companies and organizations. I hope that I will be able to welcome many active players and spectators at the Vienna Taekwondo Festival 2019 and I am sure that this will be an unforgettable day for everybody. 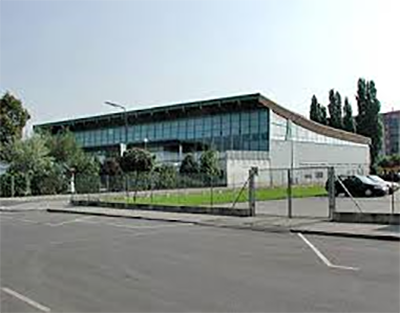 The event location at Hopsagasse in Vienna is one of the largest spors halls in Vienna. It features a total space of 63 by 36 meters for competitions. This will be large enough to set up multiple competition areas for the competitions of the Vienna Taekwondo Festival as well as those of the Vienna Taekwondo Championships at the same time. The sports hall can be easily reached by public transportation: Bus No. 11A or N29. Event competitions will start from approx. 09.00 a.m. in the hall. Any Taekwondo club or single practitioner can participate. You find more info about that in the outline. Spectators are very welcome. We will charge no entrance fees. What makes the Vienna Taekwondo Festival so special ? There are certain restriction for participation at „normal“ Taekwondo competitions (federation membership, high minimum qualification, a.s.o.). 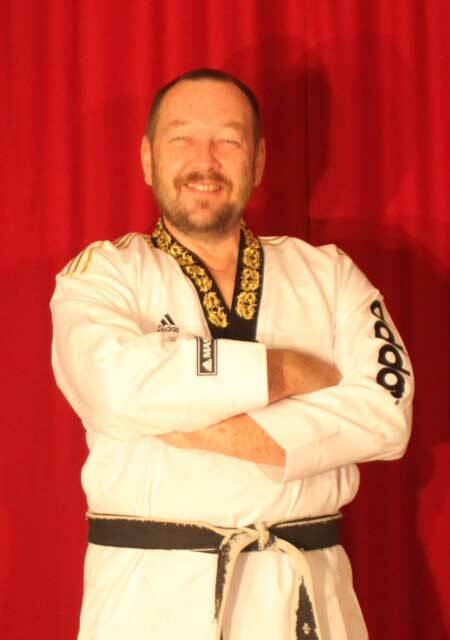 At the Vienna Taekwondo anyone can participate, provided that he or she has earned a minimum 8th Kup. There are age- and graduation categories that will guarantee equal chances for everyone competing in the various categories. Normally, there are only Taekwondo competitions for full contact or traditional forms. At the Vienna Taekwondo Festival we have many additional attractive categories which will apply especially to the spectators, e.g. Serial Breaking, Taekwondo Aerobic, Power- and Record-Breaking or Team Demo. It is our utmost concern to prove the close connection between Taekwondo and korean culture. Therefore, at any Taekwondo Festival, we have a festive opening ceremony with elements from martial arts, dance and music. It gives us great pleasure to know that our efforts are acknowledged and valued officially. This has been proven by the continuous support by the Embassy of the Republic of Korea in Austria. 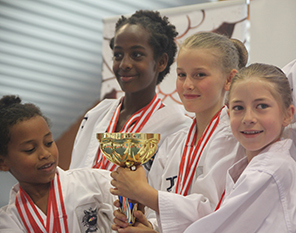 You can win medals and trophies at the Vienna Taekwondo Festival. But our main goal is to have joy and pleasure when doing Taekwondo together with friends from near and far. At the end of the day, everybody should go home with good feelings and being sure to have met old friends and have found new ones. The well known MOOHWA Demoteam not only showed its fulminant Taekwondo-show at the opening ceremony, their members als participated at the competitions. Especially their Team-Demo impressed the spectators for years to come. 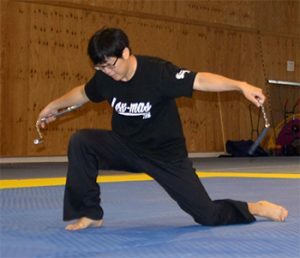 Cho Bumjin is a Nunchaku expert from Korea and was flown in for the opening ceremony of the Vienna Taekwondo Festival 2016. He not only wowed the public with his spectacular show but he also led a high-class Nunchaku Seminar during his stay in Vienna. Record-Breaking events were the Highlights of the past festivals. High- and Long Jump Breaking are measured by using an original breaking machine from Korea, for Power Breaking we use standardized breaking material. 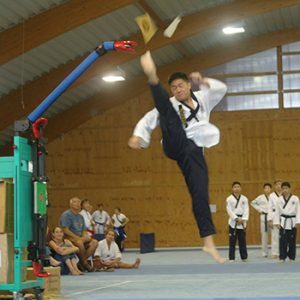 The Taekwondo club Mustang from Vorarlberg not only has participated at all Taekwondo festivals so far, their team also achieved the overall trophy in medal ranking at the 2016 festival. The Korean Samulnori group brought traditional Korean feeling to our opening ceremony. 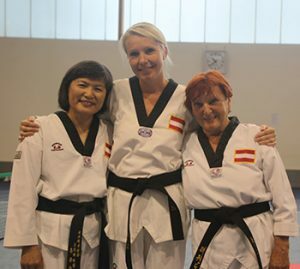 This ladies trio was victorious in the category Group Poomsae. Here they are remunerated for many weeks of hard training. Power Breaking is about who can break the highest number of boards or plasic roof tiles. The breaking material are standardized wooden board imported from Korea or reusable plastic tiles. 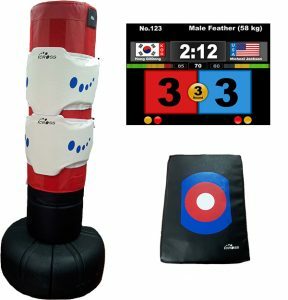 Electronic Sandbag Kicking: who can get the most valid kicks in 30 seconds? Electronic Board Breaking: who can break the most virtual boards? 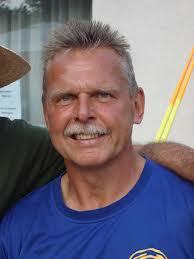 Perfect Herr Dr. Mosch I have tired to contact you by phone to congratulate you in person. What I have seen was a unique Event again _ CONGRATULATION to you and your team. Primarily to you.